Many new traders spend days, weeks, or even months trying every possible time frame in an attempt to find the one that makes their trading profitable. They try everything from 30-second charts up to monthly charts and then try all of the non-time-based time frames (e.g., ticks, volume, and price ranges), and when none of them make a profit, they blame an incorrect time frame and try them all again, thinking that they must have missed something the first time through. When they still don't find a profitable time frame, they adjust their trading system or technique slightly, and then they try all of the time frames again, and so on. The thinking behind this method of choosing a chart time frame is that each trading system or technique has a single time frame that it will work at, and/or that each market has a single time frame that best suits the market's personality. If this sounds reasonable to you, then be careful, because you may be about to enter the never-ending time frame search, from which many new traders never emerge. 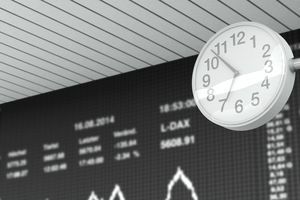 Professional traders spend about 30 seconds choosing a time frame, if that, because their choice of time frame is not based on a trading system or technique, nor usually upon the market that they are trading, but upon their own trading personality. For example, traders that like to make many trades throughout the trading day might choose a shorter time frame, while traders that like to make only one or two trades per trading day might choose a longer time frame. The reason professional traders do not spend endless amounts of time searching for the best time frame is that their trading is based upon market dynamics, excepting the statistical traders, and market dynamics apply in every time frame. When evaluating a certain time frame with regard to your trading method, a price pattern that has significance on a two-minute chart will also have significance on a two-hour chart, and if it does not, then it is not a relevant price pattern at all. In other words, if your trading system or technique is not making a profit, there is nothing wrong with the time frame, but with your trading system or technique instead. Many professional traders do not choose a single time frame at all, but use a combination of short-term and long-term time frames, and make both short-term and long-term trades on the same market. There is nothing wrong with using non-time-based time frames, and if you prefer them visually, then go ahead and use them, but don't use them because you think that they have some advantage over each other or over time-based time frames.